Meet up with infamous smugglers Han Solo and Chewbacca! 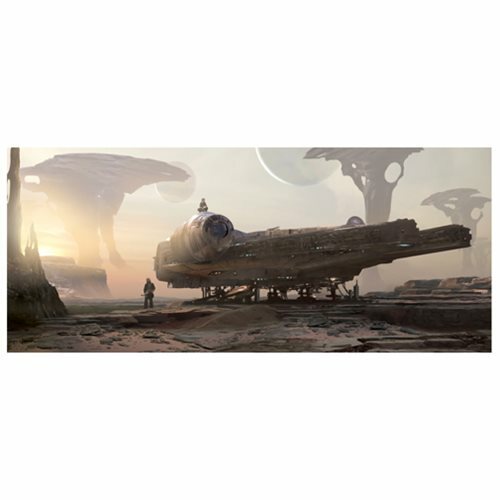 This Star Wars Smuggler's Rendevous Canvas Giclee Art Print by Stephen Martiniere features the Millennium Falcon on the surface of a planet, with Chewie standing on the ground and Han perched atop the Millennium Falcon. A limited edition of 295 pieces hand-numbered and signed by the artist on canvas, this beautiful piece of artwork comes complete with certificate of authenticity and measures 20-inches wide x 12 3/4-inches tall. Ages 13 and up.